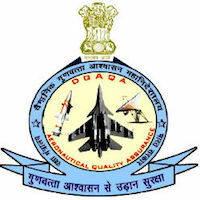 Online Application Details for Directorate General of Aeronautical Quality Assurance DGAQA Recruitment of 171 Tradesman Skilled Grade and 25 Tradesman Mate is given below. Application form and duly attested documents are to be sent to The Commanding Officer, Aeronautical Quality Assurance Wing (Armament), DGAQA, Ministry of Defence, Khamaria, Jabalpur, Madhya Pradesh-482005. In envelope super scribed with 'Application for the Post of Post Name'.